- ✔FORM - Beautiful Matt Stainless Steel Nest Thermostat Cover Plate 6" in Diameter. Custom-made Stainless Steel Matches the finish of the 2nd and 3rd Generation Nest Thermostat. - ✔FUNCTION - Easily cover up the holes of your old thermostat. Fits All Generations of Nest Thermostats. Easy Installation Saves Time VS. Painting or Wall Patching. 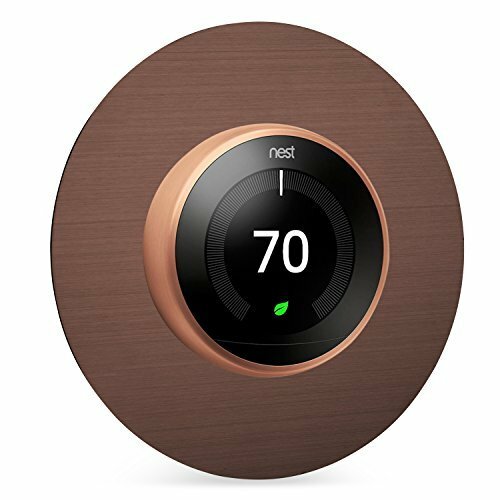 - ✔WASSERSTEIN SAVINGS FOR NEST CAM ACCESSORIES - Realize huge savings when you buy our Nest Thermostat Wall Plate together with our other Nest Cam Accessories - Use discount code 'NestDeal' at the checkout. Other Nest Cam Accessories include our colorful silicone skins to protect and camouflage your Nest Cam Outdoor (ASIN: B01MDLZC4Q / B01MA3RYJ9 / B01MCTHGMI) or our Nest Cam AC Mount in black and white for Nest Cam Indoor (ASIN: B01G9MNH6Q / B01HICIXS8).